A high-performance exhaust system helps your car perform correctly in more ways than you may realize, regardless of whether it has a stock or aftermarket exhaust system. Your car's performance exhaust system keeps the engine running correctly and toxic exhaust fumes from entering the interior. High-performance exhaust systems provide your vehicle with the best possible fuel efficiency while also reducing harmful exhaust emissions that pollute the air. Other functions of performance exhaust systems for cars include reducing the temperatures of the exhaust and muting engine noises. 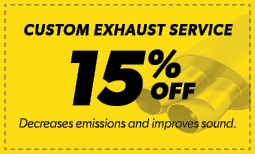 Make sure to stop by Meineke #1008 in Manchester, CT, right away if you suspect your exhaust system has a problem. It's important for drivers to know the signs of a failing aftermarket exhaust system. The easiest way to tell if there's a problem is when your exhaust system starts producing a louder sound. This means there is a leak in your high performance exhaust system. Leaks are usually caused when the flexible weave of the exhaust system starts to rust. This is the most vulnerable part of your exhaust. If you've noticed that your exhaust is louder and you're worried about a leak, contact Meineke #1008 at Manchester, CT. and we'll diagnose the problem and take care of any muffler repairs you need. If you start to notice a loss of power or a new vibration when driving your car, make sure to have the exhaust system inspected by a professional in Manchester, CT. We are a premium muffler shop specializing in muffler repairs and high-performance exhaust systems. You may notice a new vibration when handling the steering wheel, touching foot pedals, or just sitting in the seat. This may be an indication that your car's engine is no longer operating at peak capacity. Our experts at Meineke #1008 can provide a muffler repair cost estimate, perform muffler repairs and recommend custom exhaust systems for your car. A catalytic converter is a commonly overlooked item on a car. This component is located inside of the exhaust pipes. It reacts chemically with spent fuel vapors that pass through it and completely burns away pollutants before they reach the outside air. Manufacturers are required to warranty these components for only 80,000 miles. 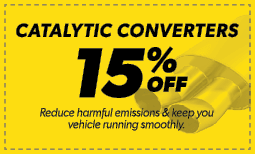 While necessary, catalytic converters also restrict the efficient flow of air through an engine, which can minimally reduce the power output. High performance exhaust systems overcome this limitation, and many aftermarket exhaust components enhance the original design. Replacing worn out catalytic converters and installing custom exhaust systems are complicated jobs. Contact our in Manchester, CT, to see what we can do to improve or repair your vehicle. Unless you are a trained mechanic, you may miss warning signs of serious problems with your vehicle. Save money the smart way by stopping by our online exhaust repair coupon site. Not only will your inspection and repairs be made by a professional mechanic at Meineke #1008 in Manchester, CT, you may save yourself valuable time and money in preventing future issues with your muffler or exhaust system.